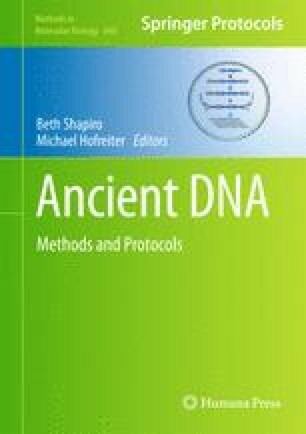 Recent advances in high-throughput DNA sequencing technologies have allowed entire nuclear genomes to be shotgun sequenced from ancient DNA (aDNA) extracts. Nonetheless, targeted analyses of specific genomic loci will remain an important tool for future aDNA studies. DNA capture via hybridization allows the efficient exploitation of current high-throughput sequencing for population genetic analyses using aDNA samples. Specifically, hybridization capture allows larger data sets to be generated for multiple target loci as well as for multiple samples in parallel. “Bait” molecules are used to select target regions from DNA libraries for sequencing. Here we present a brief overview of the currently available hybridization capture protocols using either an in-solution or a solid-phase (immobilized) approach. While it is possible to purchase ready-made kits for this purpose, I present a protocol that allows users to generate their own custom bait to be used for hybridization capture. I would like to thank the Volkswagen foundation and the Max Planck society for funding and M Stiller for helpful comments on this manuscript.